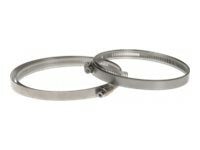 Marine-grade (SS 316L) stainless steel straps for marine, underground, and other high corrosion applications. The straps have a TX30 screw interface for easy and safe installation, and no need for special mounting tool. These straps suit poles between 100-410 mm (4-16 in) in diameter.